Voting 14 to 1 to recommend the drug, the advisory panel to the U.S. Food and Drug Administration concluded that liraglutide is safe and effective enough to warrant approval for use in chronically obese patients with at least one weight-related health issue. 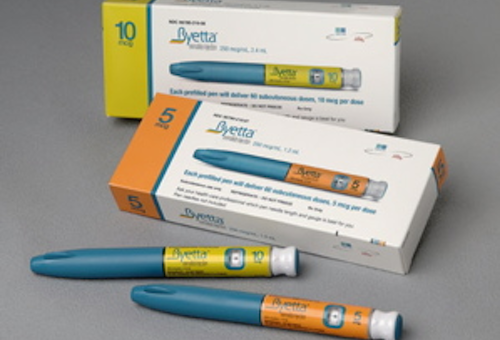 The drug liraglutide is already approved to treat diabetes at lower doses under the brand name Victoza. If approved for obesity by the FDA, it would be sold under the name Saxenda. In the stomach, some of the food you eat breaks down into sugars. One of those sugars is glucose, the body’s main source of energy. Glucose enters the bloodstream and the levels of glucose in the blood — commonly referred to as “blood sugar” — increase. When your body senses an increase in blood sugar, it sends a hormone called glucagon-like peptide-1 (GLP1) to the pancreas to stimulate insulin release into the bloodstream. Insulin causes cells (particularly liver, fat and muscle) to absorb the glucose, reducing the level of blood sugar. Glucose in cells is used for fuel. Another hormone called glucagon has the opposite effect of GLP1, which stimulates the liver and muscles to break down stored glycogen (long chains of glucose) and release it into the bloodstream. Together, insulin and glucagon are part of a feedback system that keeps blood glucose levels stable. People with diabetes don’t produce insulin (type 1 diabetes) or aren’t sensitive to it (type 2 diabetes). Because of this, their bodies produce high levels of blood glucose, which can damage blood vessels and subsequently cause vision problems, nerve damage and kidney disease. Heart disease and stroke are major causes of death in people with type 2 diabetes. Liraglutide is a long-acting glucagon-like peptide-1 agonist that works by mimicking the function of the body’s natural hormone glucagon-like peptide-1 (GLP1), which is naturally released after eating and regulates the body’s insulin secretion. Agonist is a biochemistry term for a substance that initiates a physiological response when combined with a receptor. Liraglutide binds to GLP1 receptors and stimulates the release of insulin while suppressing the release of glucagon. So why use a diabetes drug for obesity? The loss of insulin sensitivity in type 2 diabetes results in frequent hunger and weight gain, which can be controlled by lowering blood sugar. A recent study of people taking liraglutide for over a year lost an average of 8 percent of their body weight, compared with 2.6 percent lost by those taking a placebo. According to the U.S. Centers for Disease Control and Prevention, more than one-third of American adults are obese. Excess weight is a leading cause of heart disease, stroke, diabetes and certain cancers. If approved, as an obesity drug Saxenda would compete with Qsymia from Vivus Inc. and Belviq from Arena Pharmaceuticals Inc. and Eisai, as well as a recently approved new drug called Contrave from Orexigen Inc. It’s already becoming a crowded market, estimated to increase to $8.4 billion by 2022.